This majestic residence is a composition of every modern residential feature designed within a sculpture of a dwelling with roof lines that angle, stretch and soar; an exterior which lures you inside where competition for your attention is drawn between the enchantment of the interior tall spaces and the dramatic energy of Lake Erie and its’ skies through the windows to the exterior. 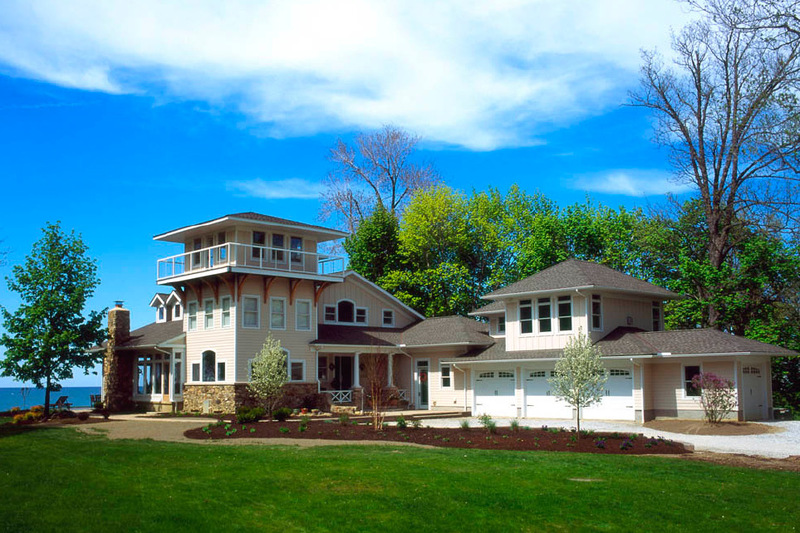 It is rare, unfortunately, that a residence on a unique property takes full advantage of the property’s assets, but this residence is a Timeless Sentinel on Lake Erie. Being on the waterfront, the home is viewed as a fish bowl from all sides in which every exterior angle has its own importance not compromising the homeowner’s interior views from every room. It was natural to need to create a light, open, and airy sense of structure that technically will withstand the harsh northern climate on the shores of Lake Erie in northeastern Ohio. Other challenges included the selection of exterior materials which were low on maintenance and were durable yet would be warm and natural looking. This was accomplished with the use of textured cement board siding with a soft tan paint finish, natural stone, stained stamped concrete and Ipe’ wood decking on the third floor Widow’s Walk supported only by the timber frame built cypress wood brackets. The Fellers desired a home to accommodate many guests who may wish to stay the night, their family’s lifestyle now and also for the growth in the future for spouses and grandchildren; and a home which will withstand the hands of time, generation to generation, always being the jewel of the shores of Lake Erie blending in like it has always been there, yet just newly built. “We feel we’ve accomplished all the goals we set out to, and more,” as quoted from the Fellers.